Get a global view of the latest attacks on your organization based on threat feeds from existing security assets. Act on anomalous behavior that needs immediate attention by gaining insight into relevant details about attack sources, attack types and targeted entities. Replay alert history to go back in time and see what happened before an anomaly was detected. Access advanced threat intelligence in real-time by filtering attacks based on protocol, geo-location, inbound/outbound direction, or via feeds from the LinkShadowCloud. See. Detect. Flag threats in real-time. In most organizations security breaches go undetected. These hidden threats often go unnoticed for months. It is imperative to find these threats before serious damage can be caused. With LinkShadow, it is possible to find and address threats in your environment. 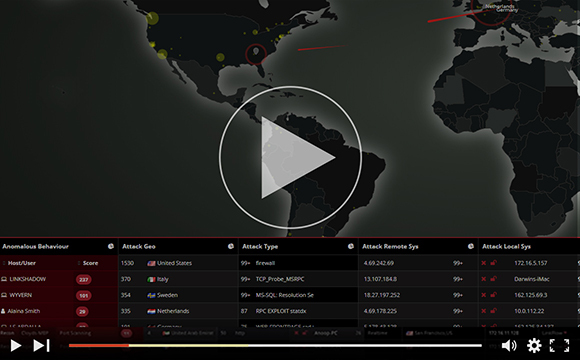 Visualize cyber-attacks and modern-day threats in your network in real-time with a Live Attack Map powered by best-of-breed threat intelligence to identify sophisticated and hidden dangers lurking in normal network traffic. Get insight into the top attack sources, the types of attacks and the top entities being targeted on your network.